Brett Kavanaugh was sworn into the United States Supreme Court on October 6th, 2018. A highly controversial nomination, Kavanaugh’s confirmation highlighted the difficulty in ascribing the fundamental principle of fairness to both parties in sexual assault proceedings. Innocent until proven guilty, the central principle of the United States’ legal system, balanced against a responsibility to protect those who allegedly experienced a sexual assault. The nation was divided; some believed that Kavanaugh’s due process had been violated and others, that the nation should believe survivors. Universities often feel the effects of decisions made in Washington and the Kavanaugh appointment was no exception. The Trump Administration is currently releasing new Title IX guidelines that would replace those set by the Obama Administration’s “Dear Colleague” letter. These updated guidelines would allow accused students to cross-examine accusers, universities to use ‘clear and convincing evidence’ as a higher standard of proof, and narrow the definition of sexual harassment. 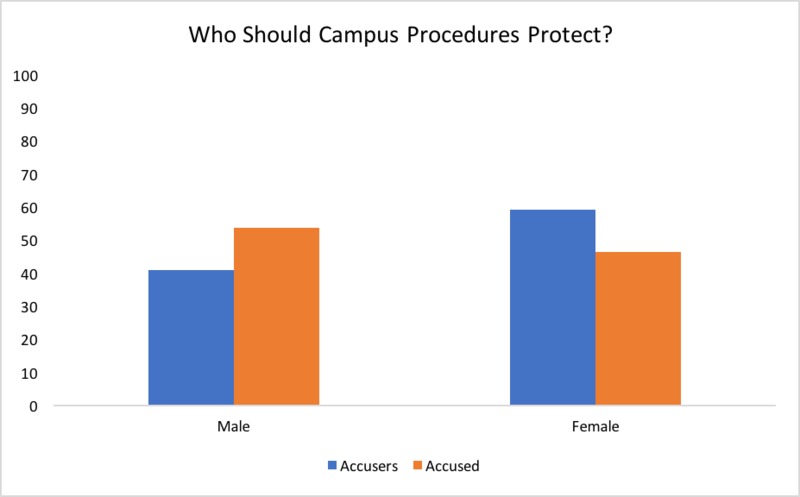 In light of these new guidelines and the divisions exposed by the Kavanaugh appointment, in a nationally representative survey, the Bucknell Institute of Public Policy asked individuals if campus sexual assault procedures should protect accusers (even if some people are punished for things that they didn’t do) or the accused (even if some people guilty of assault are allowed to go free). By first examining partisanship, the survey showed that 51% of Democrats and 14% of Republicans believed that sexual assault proceedings should favor protecting the accusers. 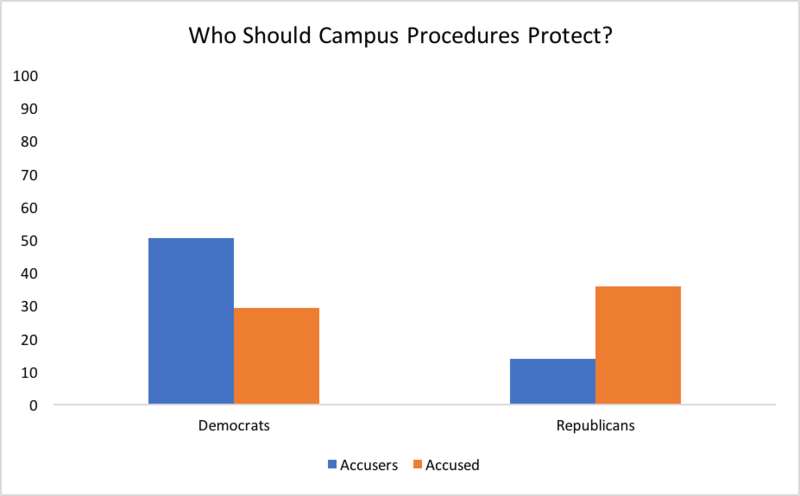 As for the accused, 29% of Democrats believed accused students should have more protection, juxtaposed to 36% of Republicans. The Bucknell Institute of Public Policy also examined how gender affects a decision to favor the accuser or the accused in sexual assault proceedings. The survey showed that 41% of men and 59% of women believe that sexual assault procedures should favor protecting the accusers. On the other hand, 54% of men and 46% of women believe that accused students should be allotted more protection. Brett Kavanaugh’s appointment to the United States Supreme Court highlighted the difficulty between protecting someone’s right to due process and preventing harm to an alleged sexual assault survivor. The Trump Administration’s new Title IX guidelines will only continue to highlight the growing debate in both higher education and on the national stage. Who should we protect and why? To see how opinions have changed in a post-Kavanaugh climate, feel free to read “What the Brett Kavanaugh Controversy Teaches Us About Higher Education’s Sexual Assault Procedures” on the Bucknell Institute of Public Policy’s blog.